Preheat oven to 180°C/350°F. Butter a 42x30cm (17x12in) rimmed baking sheet, line with foil and butter the foil as well. Spread batter into prepared pan. Bake until edges are golden, about 25 minutes*. Let cool completely in pan on a wire rack. Cut into 5cm (2in) squares or desired shape. The blondies can be stored in an airtight container for up to 1 week. Delicious! I love the deep colour they have. Maybe they ought to be strawberry-blondies! Oh it gets me drooling, too. What a genius creation. Gorgeous, beautiful, fantastic. As usual. Hi, Patricia. I'm Spanish and in Spain it's not usual at all to find recipes which include this kind of spices, but I must confess that I love them, as you do. So I'll have a look at Martha's recipes collection to get ideas. Your blondies look amazingly gorgeous! It's a pity I can't enjoy them now! Those are perfect. So amazing! I bet these would also be good with cinnamon chips as well. They really look quite chewy and perfect. I had never seen a gingerbread blondie before. Perfect for the holidays. Wow these look amazing. I love the white chocolate gingerbread combination. oooh yum! These look so chewy and good! I'm intrigued by the white chocolate - gingerbread marriage. Gonna have to try that! Beautifull! but I have always the same problem with gingerbread like recipes.. molasses! do you know some kind of replacement? do you get it in Brazil? Wow! What a beautiful blog!!! Compliments & Merry Christmas !! The largest pan I have is a 13 x 9. Do you think that would be okay? These look and sound completely perfect!! 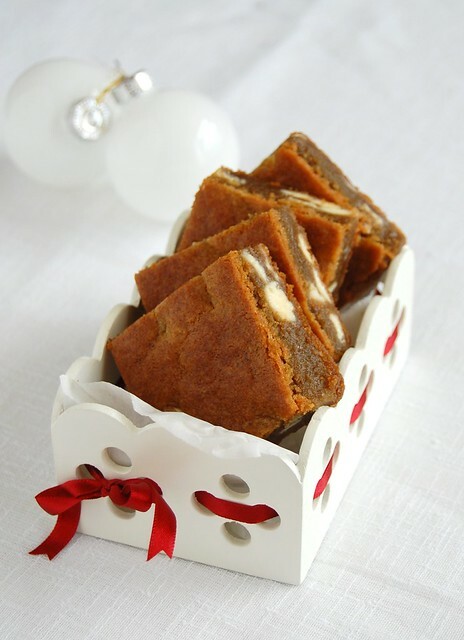 I love the combination of white chocolate + gingerbread, and a blondie sounds like the perfect vessel to pair them in. Yummy! I plan to try to covert this with gluten free flour for my daughter. Let you know how it turns out.